To celebrate five years of NT100 we’ve revisited BuffaloGrid to understand what’s helped the initiative grow, since it featured in our 2014 NT100. If you’ve ever left your house without a charged phone, you know all too well the desperation that comes with seeing your battery percentage diminish to zero. For more than a billion people this is less frustrating mishap, more everyday reality. For those who live ‘off-grid’, this means using expensive and polluting diesel generators or making a trek to a bigger town to find an expensive charging kiosk. For those who live in ‘grid-edge’ communities, it means worrying about frequent power outages, and never knowing when you may lose electricity for days or weeks. Ad hoc – and potentially lethal – electricity fixes are common in grid-edge areas, as Neeraj, who runs a village shop in northern rural India, knows. 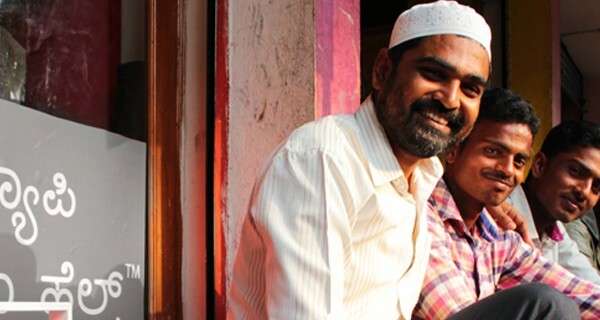 Every morning, Neeraj and his nephew connect a lead-acid battery to overhead power lines to power a number of electrical goods in the store, which can lead to damage to the goods, and electrical shocks for the people operating them. According to the World Bank, 1.06 billion people do not have access to electricity, although 6 billion have access to mobile phones. Bloomberg reports that in most countries, people tend to have better access to a cellular network than to the grid. In Tanzania, for example, 82% of people have access to a 3G network or better, but only 30% have access to electricity. While smartphones have the potential to enable more people to take part in the global digital economy, without a steady supply of electricity this potential remains untapped. It’s a problem that Buffalo Grid, a British company providing charging hubs mainly to off-grid and grid-edge communities, is trying to solve. The idea first originated with Phil Schluter, a coffee trader living and working in Africa for over 20 years. He regularly saw local people spending hours trying to charge their phone. In 2010, he sought help from industrial design engineer Daniel Becerra to come up with a product that would help the local population keep their phones charged and usable. The pair first developed a bicycle-powered generator, which created enough electricity to charge 20 mobile phones and generated revenue comparable to working in the field for eight hours. The problem was the amount of cycling needed – four hours every day. The farmers given the bike to test wasted no time in returning it. Becerra then came up with a portable generator hub powered by a solar panel that could charge 24 phones at the same rate as a wall socket. Calling the device Buffalo Grid after a buffalo charge, Becerra and Schluter ran a small trial in Uganda in 2013. According to The Guardian, 80% of people in Uganda own a mobile phone but only 5% have access to power. Charging a mobile phone can cost $0.20 – a significant financial burden for those who live on less than $1 a day. The hub was given away to local agents, primarily coffee farmers known to Schluter. They used the hub to sell phone charges to customers, gaining extra revenue, while providing accessible and affordable phone charging to local communities. Customers paid for a charge by sending a text to a local number, and agents received a monthly mobile payment with a cut of the revenue from Buffalo Grid. The pilot proved that the system worked, and Buffalo Grid next turned their attention to India, home to the world’s largest in-country, off-grid population: 304 million, and 67% of the rural population, according to a 2015 report by Washington Post. In 2015, they ran a 12-month trial in Uttar Pradesh – home to 64 million people. Villages were selected according to open source data, remote surveying techniques and a proprietary grading system based on grid power, foot traffic and network signal to ensure maximum impact. Throughout the trial, Buffalo Grid delivered over 250,000 mobile phone charges to over 62,000 unique users, which roughly translates to 2 million hours of air-time calls. At the same time, 24 local agents received a 30% share of revenue, “which for some of our most successful agents, has seen an increase of nearly 50% of their monthly average income,” says Fogg. Agents were paid by Paytm or bank transfer, while Premium SMS, M-Pesa or Paytm could be used by customers to purchase a phone charge. Buffalo Grid provided the first 15 minutes for free, after which it charged a small amount between three and eight rupees depending on length of charge and location. For some of the agents the extra revenue is life enhancing. “About 70% of my income from Buffalo Grid goes straight to my children,” says Anita, an agent in Kundur, in India. “The rest, I spend on myself. I can send my daughter to dance class, pay for school fees and books. Before Buffalo Grid my daughter did not go to dance class." There is now a second dust- and water-proof version of the hub, which can charge 28 phones simultaneously at the rate of a wall socket, and will be deployed with selected partners in early 2018. It can be powered by the grid as well as a solar panel, and can transmit Wi-Fi. It has an OLED screen, which can display advertising, entertainment and information, and a camera. Buffalo Grid’s ambition is to do the same with electricity. The company’s business model is to get telephone companies, banks and internet providers to buy or rent the equipment for an on-going subscription fee. The hope is that they will then provide charging for free so that more people can get online and use the services that generate revenue for those partners. “Our end goal is to basically provide free power. The thing we’re engaging at the moment is who’s going to pay for the hub and service to make that the case,” says Fogg. The idea is certainly on trend: Google recently introduced free wifi at 200 train stations in India with the same purpose. The company currently employs 10 full-time staff in London and five in India, as well as a network of agents. “Our agents are the stars in our story. They are the link to their communities. They are usually shop owners so people will already go to them to get their sweets, their money, their power,” said Becerra at WIRED’s Energy Conference in 2016. To date, Buffalo Grid has received grants from DfID and Microsoft, as well as raising £496,000 on Crowdcube and £400,000 from investors. Time will tell how the company balances its social cause with its commercial goals as it pursues new markets. While a commercial focus promises to deliver more power and connectivity to millions of people, some would argue that our increasing dependence on digital communications, smartphones and the electricity we require exacerbates our energy problem rather than improves it.